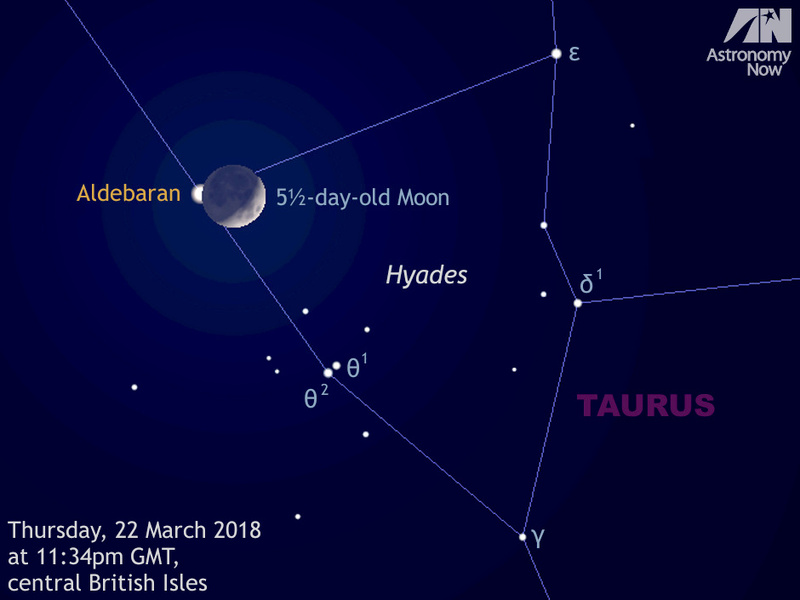 On Thursday, 22 March, observers in the British Isles with clear skies can see the 5½-day-old setting crescent Moon occult first-magnitude star Aldebaran in the constellation of Taurus shortly after 11:30pm GMT (see below for precise times). This simulated view is approximately five degrees high, corresponding to the field of a typical low-power binocular. AN graphic by Ade Ashford. The Moon previously passed in front of Aldebaran on 23 February, but observers in the British Isles missed the star’s disappearance owing to daylight, while the star’s reappearance occurred in very bright twilight for most in the UK. Now, one lunation later, observers in the British Isles get their second – and last chance for 2018 – to see Aldebaran slide behind the Moon. Potential observers of this interesting occultation should be aware that it occurs about an hour before moonset for the heart of the UK, so you will need to find a viewing location that offers a level horizon in the west-northwest unencumbered by houses or trees. The Moon occults magnitude +0.9 star Aldebaran a few seconds after 11:34pm as seen from the centre of the British Isles. As viewed from London, the star disappears behind the advancing dark lunar limb shortly after 11:38pm, or just before 11:31pm if observed from Edinburgh (all times in this article are GMT). Depending on where you live in the UK, you may be lucky enough to see Aldebaran reappear at the Moon’s bright limb shortly after midnight. Sadly for Londoners, the Moon sets before this happens. Those in the north and west of the British Isles are favoured, so observers in the Scottish capital can see Aldebaran emerge from behind the Moon a few seconds after 12:14am on Friday morning. Another example: skywatchers in Cardiff can see the disappearance and reappearance of the star at 11:40pm on the 22nd and 12:16am on the 23rd, respectively. Do bear in mind that at Aldebaran’s reappearance the Moon and star will be extremely low in the sky so you will need a very clear and transparent sky. My advice for any budding occultation observer is to have your telescope setup (or large binoculars steadied by leaning your elbows on a low wall or fence) at least 10 minutes before the predicted time so that you don’t miss out — plus it’s fun to see the advancing Moon glide ever closer until the star finally disappears from view. Astronomers are exploring what might be described as the first astronomical observing tool, potentially used by prehistoric humans 6,000 years ago. 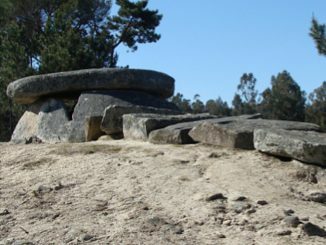 They suggest that the long, narrow entrance passages to ancient stone tombs may have enhanced their view of the night sky, enabling them to detect the first appearance of seasonal stars during twilight. Jupiter now lies highest in the UK sky at sunset, but the Solar System’s largest planet and its four bright Galilean moons still provide plenty of observable events during June, as we reveal. 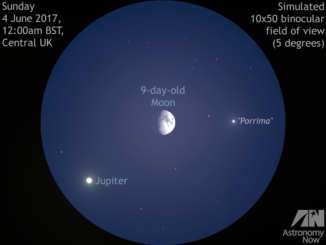 If you’re uncertain which evening ‘star’ is Jupiter, the Moon conveniently passes by on the night of 3—4 June, a time when European skywatchers can also see the Moon occult (hide) bright double star Porrima. The Moon’s thin atmosphere contains neon, a gas commonly used in electric signs on Earth because of its intense glow. 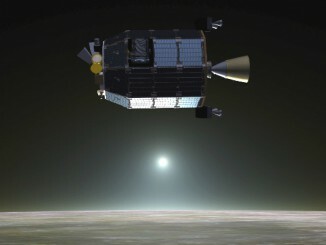 While scientists have speculated on the presence of neon in the lunar atmosphere for decades, NASA’s Lunar Atmosphere and Dust Environment Explorer (LADEE) spacecraft has confirmed its existence for the first time.